China: S Gansu, SE Qinghai, Sichuan, S and E Xizang [Tibet] where the population is very scattered in many areas. Juniperus tibetica forms groves or small forests at high altitudes, often together with J. convallium. The altitudinal range is 2600–4780(–4900) metres above sea-level. These woods are often grazed by cattle (yaks) and degraded, being transformed into parkland with mats of Cyperaceae and low grasses and herbs, or further to Berberis-Juniperus scrub and Artemisia steppe. At lower altitudes it may occur in clearings of Picea forest, usually on south-facing slopes; at the tree limit, where it may be the only species, it returns to south-facing slopes indicating that temperature is the limiting factor. Locally it occurs in open stands of Cupressus torulosa var. gigantea. It occurs on rocky slopes and ridges, as well as old gravel terraces, on rocky soils from siliceous as well as calcareous parent material. 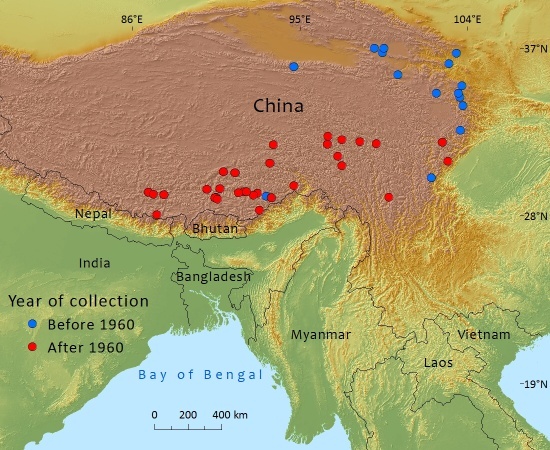 The climate, mostly in the monsoon shadow of the main crest of the Himalayas, is continental with extremes of solar radiation and frost. As the principal high altitude tree in large parts of Xizang [Tibet] and adjacent areas, this species is an important source of wood to local people, who use it for firewood and on a limited scale for other purposes, such as incense in Buddhist rituals. Increased population pressures in recent decades have resulted in shortages of a resource that renews itself only very slowly. It is rare in cultivation; seeds were collected by Joseph Rock in southern Gansu in 1926 (and distributed under the synonym J. distans); plants raised in the UK grew into a columnar habit with light green leaves. This species is widespread but there is, however, considerable pressure from both direct uses by indigenous peoples (firewood in particular) as from grazing by domestic animals, which are likely to increase and have a detrimental effect on regeneration and possibly its long term survival in many areas (Miehe, pers. comm.). Few trees are under protection where growing on sacred (Buddhist) sites. Field studies and community engagement projects have been undertaken with the help of researchers from the University of Marburg, Germany (Georg & Sabine Miehe) to assess the situation and try to find alternatives for destructive use of trees and habitat. Larger, and well managed/policed reserves, are urgently needed. Farjon, A. (2013). Juniperus tibetica. In: IUCN 2013. IUCN Red List of Threatened Species. Version 2013.1. <www.iucnredlist.org>. Downloaded on 06 July 2013. Miehe,G., & S. Miehe, J. Vogel, S.Co & and Duo L. (2007). Highest Treeline in the Northern Hemisphere Found in Southern Tibet. Mountain Research and Development. 27(2): 169-173. A.Farjon, 2013. Juniperus tibetica, from the website, Threatened Conifers of The World (http://threatenedconifers.rbge.org.uk/taxa/details/950).